Fig. 132.—St eps in turning a burr on a beveled-cdge scraper. In case the burr ¡.-a turned too much, it may be raUed somewhat, as at D.
greater angle until finally the burnisher makes an angle of about 75 deg. with the flat side of the scraper. In case the burr is turned too much, it may be raised somewhat by drawing the point of the burnisher along under the burr (see Fig. 132D). Fig. 133.—Grinding a cold chisel-Hold the chisel firmly against the work rest, with the first finger of the right hand touching the underside of the rest. Press the cutting edge of the chisel against the wheel with the finger* of the left hand and swing the handle of the chisel back and forth with a wri&t action of the right hand. grasped firmly in the right hand with the first finger against the work rest. 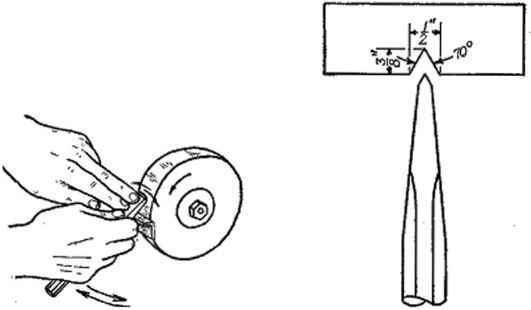 When the chisel is lifted for inspection or for dipping into water, it may be placed back against the wheel in exactly the same position if the mechanic is careful not to release his hold. Note, also, that the tool is held against the wheel with the first two fingers of the left hand while the right hand is used to swing the handle back and forth. This grinds the corners of the chisel back slightly curved cutting edge, the corners thus relieved, there is less danger of breaking them off. 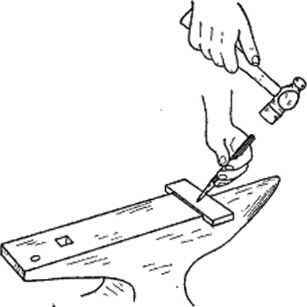 A simple gage for checking the cutting angle of a chisel is easily made of sheet metal (see Fig. 134). The chisel should be dipped into water occasionally while grinding to prevent drawing the temper. Fio. 136.—A center punch may be a little and gives a easily ground by holding it again** the Wifl grinding wheel at the desired angle and w nn rolling it slowly. The too? should also be moved from side to aide to distribute wear over the wheel. 148. Center Punches.—A center punch may be ground easily by holding the end flat on the work rest with the thumb and first fingeir of the left hand while rolling the tool slowly with the right hand. The tool should be moved back and forth across the work rest to distribute the wear evenly over the grinding wheel. The point of a center punch should be ground to an angle of about 60 deg. 149. Prick Punches; Scratch Awls.—Prick punches and scratch awls (scribers) are ground in the same manner as center punches, o8us.Iy except, that the points aro made Cure much sharper. 150. Screw Drivers.—A screw driver should be ground to a very blunt end with the sides perfectly straight or slightly hollow or concave, never convex (see Fig. 137). The end of the blade should fit the slot in the head of the screw snugly. ^ If the end is ground to an edge like a knife, it will easily slip from the slot and mar the screwhead. Fia. 136.—A screw driver is sharpened by filing or grinding;, should be exercised to shape the end to fit the screw slot. Fio. 137.—Right and wrong shapes of screw-driver ends. Sharpening of twist drills is one of the most important grinding jobs in the farm shop. Most difficulties in drilling and most drill breakage can be traced to faulty sharpening. 1. The cutting lips must- have clearance or be ground off behind the cutting edge to allow the drill to bite into the mctaL The proper amount of clearance is about 12 deg. Fia. 138.—The lip clearance of a twist drill may be judged by noting the angle between the cutting edge« and the short line across the end of the drill. cutting end, or by standing the drill rule and rotating it. The heel of the vertically, point down, against the bench top beside a rule (Fig. 139) and then turning the drill slowly. The heel of the cutting end should register slightly higher on the rule than the front edge. 163. Length and Angle of Cutting Edges.—If both cutting edges are the same length and make the same angle with the central axis, the point of the drill will be centered. 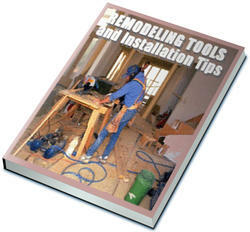 If the point is not centered, the drill will make an oversize hole, and one lip will do more than half of the cutting. If the lips are not ground at the proper angle of 50 deg. with the axis, the cutting edges will be slightly curved instead of straight and the drill will be too pointed or too blunt. 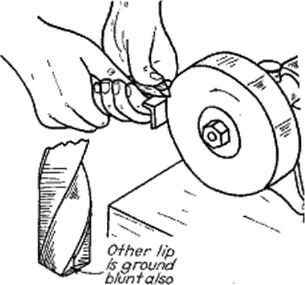 The length and angle of the cutting lips can best be checked with a gage (see Fig. 140). Such a gage can be made easily from heavy sheet metal. 1. The cutting end at about the same height as the other end. 2. One cutting lip horizontal. 3. The axis of the drill making an angle of about 59 deg. with the cutting surface of the wheel (aeo Fig. 142). Fig. 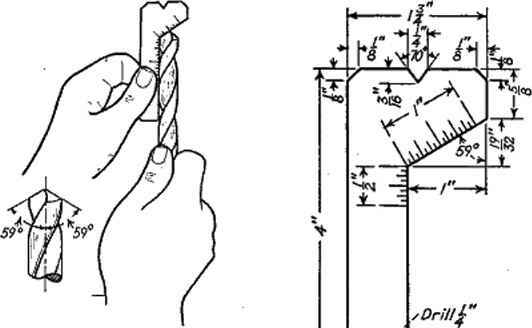 141.—Plan for a home-made twist-drill and cold-chisel grinding gage. motions or strokes be used in manipulating the drill against the wheel. With a hand-operated grinder the drill is held in the left hand while the right hand turns the crank. Where a power-driven grinder is used and both hands are free to hold the drill, the first finger of the left hand may be placed on the work rest, and the drill rocked over it. Fiu. 144.—With a power-driven wheal the end of the drill may be fmpported by the first finger of tho left hand, which is plaoed on top of the work rest. done on the last part, of the stroke by using more pressure or slower motion on the last part of the stroke. If less clearance is needed, less pressure or slightly faster motion should be used toward the end of the stroke. If there is a tendency to get too much clearance, possibly the drill is pointed too high up on the wheel at the beginning of the stroke. Flo. 145.-—For drilling: extremely hard or soft materials, the cutting edges may be ground blunt to give a scraping action. Of course the drill should be dipped into water frequently while grinding, to prevent overheating and drawing the temper. considerable use, it will be more difficult to dress than the curved grinding surface. 155« Grinding a Drill for Soft or Hard Materials.—For drilling brass or other soft metals, or for drilling hard materials where heavy pressure is required, a drill ground with the usual shape has a tendency to gouge. To prevent this, the cutting lips may be made blunt by grinding narrow, flat surfaces on the front edges, the surfaces being parallel to the axis of the drill (see Fig. 145). The drill then has more of a scraping action. 156. Removing Rust.—Brisk rubbing with an oily rag will remove light rust, while fine abrasive of some kind will be needed to remove deep rust. Extra-fine grades of sandpaper and emery cloth or steel wool are satisfactory for most tools, although pumice stone and water is recommended for renewing highly polished surfaces, provided they are promptly dried and given a light coat of oil. It is a good plan to go over the metal parts of tools in the shop occasionally with an oily rag to prevent rusting. In case tools are to be stored for a considerable time, a heavy coat of oil Ls advisable. 129. (a) Why are many edge tools used with a diagonal stroke or motion? (6) What is the chief difference between coarse-edged tools and fine-edged tools? 130. (a) What is the general method of sharpening edge tools? 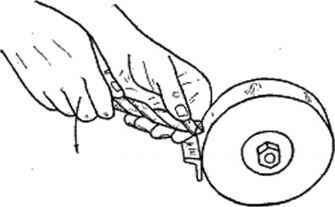 (b) Should the grinding wheel turn toward or away from the edge of the tool? Why? 131. (a) What determines whether a tool should be ground on a grinding wheel or sharpeJied altogether on an oilstone? (6) At what angle should wood chisels and plane bits be ground? (c) What simple method may be used for checking to see if the angle of bevel is about right? (d) Why should a tool be moved back and forth across the face of the grinding wheel while grinding? (e) What particular precaution should be observed in grinding a tool on the flat side of a wheel? (J) How may a wire edge be detected? 132. (a) What kind of oil should be used on an oilstone? (b) What kinds of motion may be used in whetting an edge tool on an oilstone? 133. What two particular precautions should be observed in whetting to remove a wire edge? Give reasons. 134. (a) Why should a tool be drawn over the strop with the cutting edge trailing instead of leading? (6) How may a tool be stropped in case a leather strop is not available? 136. (a) Explain and be able to demonstrate how to test the sharpness of a tooL on the cuticle of the thumb. (6) How may the sharpness of a tool be judged by simply looking at it? 136. In what respects is a drawknife sharpened differently from a plane hit or wood chisel? 137. (a) What points should be observed in sharpening a poeketknife, bread knife, or butcher knife? (Ib) Just how can the use of a sharpening steel improve the cutting action of a butcher knife? 138. What is the method generally used for sharpening an ax or hatchet? 139. (a) Why are grass sickles and scythes not whetted on an oilstone? (6) May such tools be sharpened by draw filing? 140. What precautions should be observed in grinding mower sickles? 141. How are large nicks best removed from ensilago-cutter knives? 142. 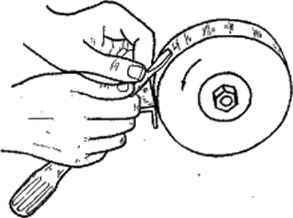 Besides grinding, how may rolling colters and disks be sharpened? 143. (a) May hoes and spades be sharpened by draw filing? (6) How may a hoe be held while filing in case a vise is not available? 144. (<i) What equipment is needed to sharpen scissors and snips? (b) What is the process of sharpening such took? 146. (a) What are the two main points to be observed in sharpening wood auger bits? (b) What difficulties are likely to be encountered if these points are not-observed? (c) What kinds of files are used in sharpening auger bite? 146. (a) What part of a wood scraper does the cutting? (6) What tools or equipment are needed to sharpen wood scrapers? 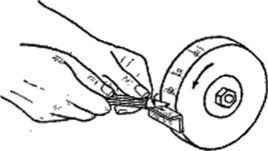 (c) Outline the process of sharpening a scraper, (d) How much pressure is needed in using the burnisher? 147. (a) For general work, what should be the angle between the bevels on a cold chisel? (6} Just how is the chisel held and manipulated while grinding it? (c) What is the advantage of grinding the corners of the chisel back, or making the cutting edge curved? 148. (a) How should the center punch be held and manipulated while grinding? (b) At what angle should the point be ground? (c) What precautions should be observed in grinding a center punch to avoid excessive wear and abuse of the grinding wheel? 149. Just how are prick punches or scratch awls ground differently from center punches? 150. (a) Describe the shape of a properly fitted screw-driver bit. (b) What are common mistakes in grinding screw drivers? 151. (a) What are the requirements of a properly sharpened twist drill? (b) What is meant by the "central axis" of a drill? 153. Why is it important that the cutting lips be the same length and make the same angle with the central axis of the drill? 154. 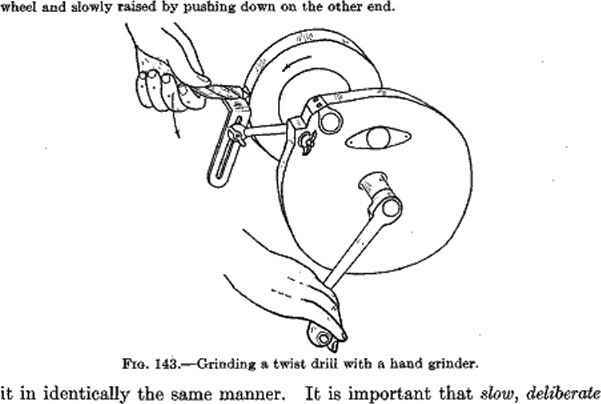 (a) Explain and be able to demonstrate just how to place a drill against a grinding wheel and manipulate it while grinding, (b) What kind of strokes or motions should be used? (c) In case it is observed that a drill is being ground with too little lip clearance, just how would you change the grinding operations or motions? 165. (a) How may a drill be ground especially for hard or soft metals? 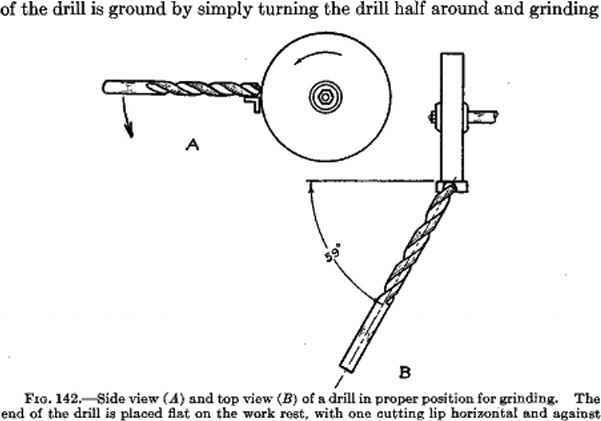 (b) How would such a drill work better than one ground in the usual shape? 166. (a) How- may rust be removed from tools? (6) How may tools be kept from rusting? Brown and Tustisox: "Instructional Units in Hand Woodwork/' Boss, Dent, and White: "Mechanical Training." Roehl: "Fitting Farm Tools." Cornell Extension Bull 378, Grinding Farm Tools. Educational charts and pamphlets, The Carborundum Company, Niagara Falls, N.Y.; Stanley Tool Works, New Britain, Conn.